Off White City Road, Fforestfach, Swansea. which is currently in use for a number of different businesses (2012) and the Fforestfach Park & Ride is today (2012). Cambrian - 4th November1864, Mr. Thomas Glasbrook Jnr. owner, Strikes vein of highly bituminous coal at Worcester Pit. 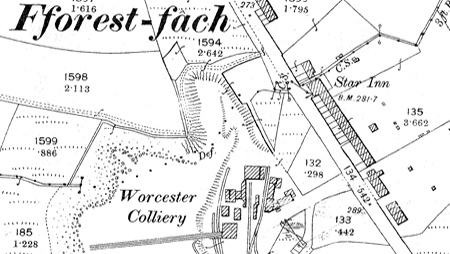 Worcester Colliery Area reproduced from (1898) Ordnance Survey map. White City Road would have connected with Carmarthen Road, the junction is under the number (134) on the map. 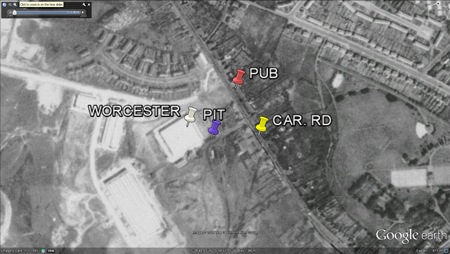 Worcester Colliery Area - Google Earth 1945. Worcester Colliery Area reproduced from (1916) Ordnance Survey map. Opposite the Star Inn, over the road are the map markings = (||||||||) indicating the large spoil bank from the old colliery. This can be partially seen from this photo of the - Boy With His Kite. 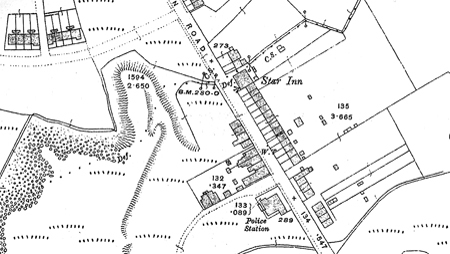 Just for interest the in the (1898) map, the County Police Station is shown roughly on the right of where Hertz Car Rental, Carmarthen Road is today (2012). The old Police Station is seen above in the (1916) map, the building then becomes a club (1936), looks like the same building changes to Clyfon Works in (1949) OS map. CAR. RD - Carmarthen Road, widened in the early 1990's. (C) J20 (MINING - COAL MINING) 1845 Mar. 29 Worcester Coal Company. First sod cut by Mr. Redhead. (C) J21 (MINING - AND GOWER) 1846 Sept. 18 The Duke of Beaufort visits Worcester Colliery and the Landore engine. (C) K62 (SOCIAL- HONOURS) 1847 May 21 Worcester Colliery Company present David Hill of Swansea with a watch. (C) J21 (MINING - AND GOWER) 1849 Mar.09 Case of Glasbrook -V- Redhead - Regarding Worcester Colliery (on Swansea to Loughor Road). (C) J21 (MINING - AND GOWER) 1849 Dec.07 Worcester Colliery near Swansea for sale. Apply Septimus Redhead, Heathfield Terrace. (C) F56 (DISASTERS - MINING ACCIDENTS) 1866 Sept. 07 Worcester Colliery, Forest Vach (Fforestfach) lifting tram, accident - tram full of coal falls into pit, damage estimate. (C) F56 (DISASTERS - MINING ACCIDENTS) 1873 Nov. 21 Worcester Colliery Case: Gas found in No. 8 level, 29th August. Explosion. P5. (C) F56 (DISASTERS - MINING ACCIDENTS) 1873 Nov. 21 Worcester Colliery Case: Benjamin Thomas found gas midday before explosion. P5. 1895 Philip Richard, Worcester Colliery. (WM) J21 (MINING - AND GOWER) 1898 Nov. 23 County Court: Elizabeth Davies, widow, sued Phillip Richard, of Worcester Colliery, Fforestfach, for subsidence at her home. "It was Thomas Glasbrook who sank the Worcester Pit, Fforestfach, down to the five ft. seam which proved to be of very good quality bituminous coal. This colliery was worked in conjunction with the Weig Fach Colliery and Pwll Sant or "Saint's Pit." The site of the latter pit is close to the north side of the main B.R. railway line 500 yards west of Cockett Station. 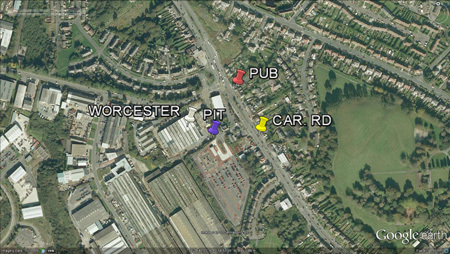 The actual site of the Worcester Pit is about 150 yards to the rear of the old Fforestfach Police Station now occupied by Messrs. White Remould Tyre Co."
"Worcester" was used to filter the Cambrian index as best as possible with the information available 25.07.2012.